Dimensions (HxWxD): 5" x 10.5" x 8"
This magnificent 10.5 inch long specimen of Pink Stilbite Mounds with Green Apophyllite Crystals, from Pune India, weighing 9.5 pounds is a collector's item with substantial mineralogical and metaphysical value, suitable for anyone who loves or works with Apophyllite & Stilbite. The combination of apophyllite and stilbite potentiates the metaphysical properties of both crystals, and creates a powerful energy field conducive to deep meditation, healing of emotional and mental wounds, and establishment of a profoundly receptive intellectual state conducive to the reception of communications from Higher Mind. Some of the finest specimens of apophyllite come from the area around Pune, India, where this beautiful cluster originated. Apophyllite is becoming the new darling of mineral collectors worldwide, as sophisticated rockhounds discover the amazing variety and beauty of apophyllite formations, ranging in size from tiny pyramids to huge clusters. 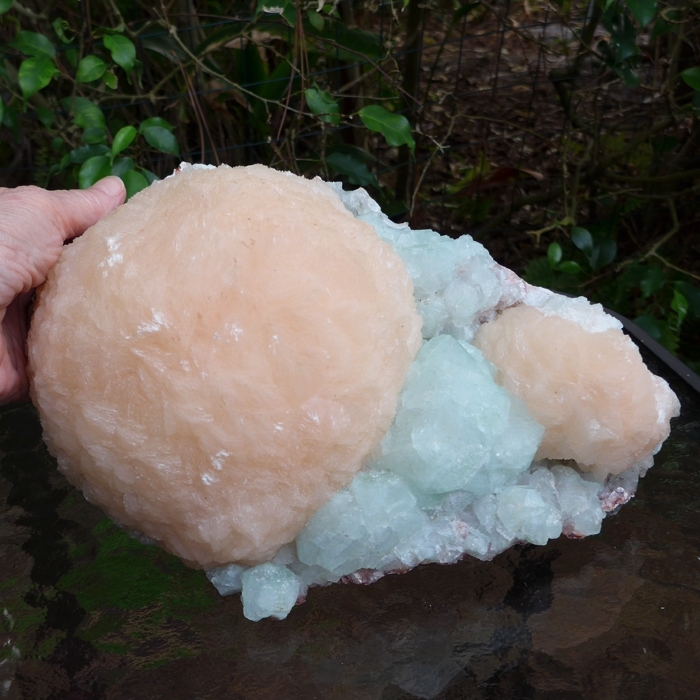 A new 150 mile long seam of apophyllite bearing rock formations has just begun to be mined in India over the last decade, and this new geological formation is yielding some amazing crystal formations, such as the one you see on this page, which has been in our personal collection for nearly ten years. Lightworkers, meditators and crystal healers have been aware of apophyllite as a powerful tool for connecting with inner spiritual guidance and the wisdom to be found in higher worlds. However the use of apophyllite clusters as altarpieces designed to raise the energy in rooms, houses, gardens or offices is a relatively new phenomenon, linked in part to the greater availability of large clusters. 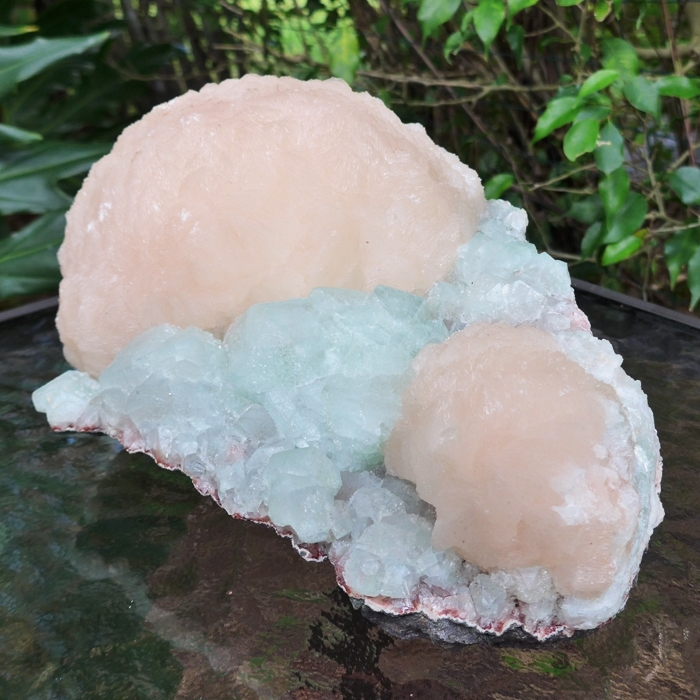 This apophyllite and stilbite altarpiece would be a wonderful addition to the collection of any energy healer or practitioner of meditation and would shift the energy in your room, treatment center or home. 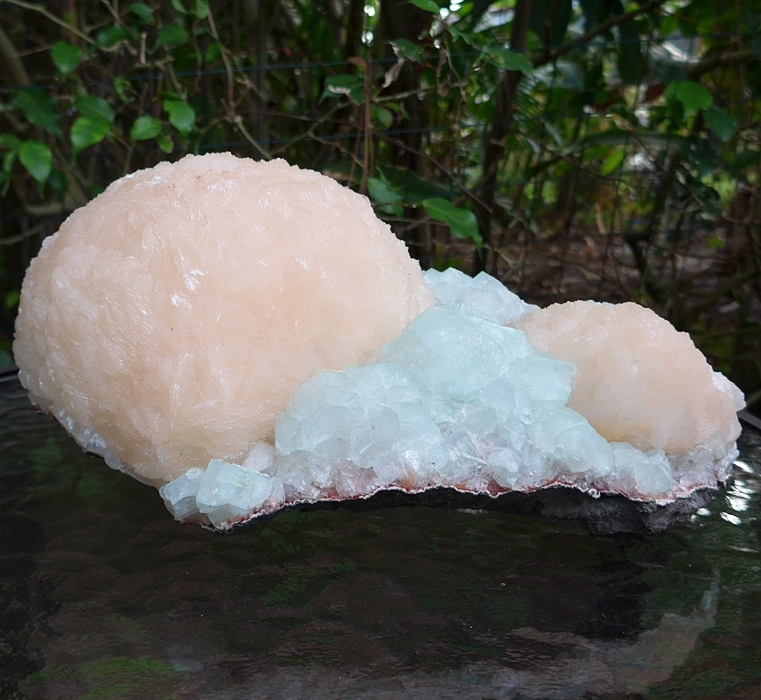 This beautiful cluster has enormous bright peach-pink stilbite mounds with lovely translucent green apophyllites growing between them. 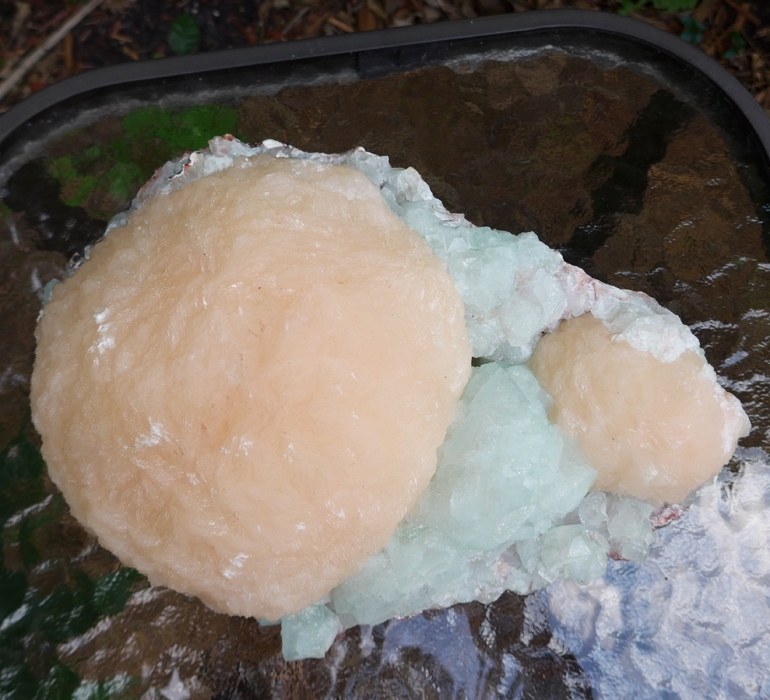 This Pink Stilbite with Green Apophyllite Cluster can be used as an altarpiece. With the stone on your altar, simply attune your mind to the Stilbite & Apophyllite Cluster and make it your intention to align your own energies with the energies of the stones. The altarpiece transmits energy & will work to attune its environment ever more closely to the higher vibrational frequencies of the spiritual world, benefiting anyone in the immediate area, especially anyone doing meditation or energy healing. You can also use this powerful crystal as a meditation tool to help you elevate & purify the energies in your meditation room, house or office & assist in aligning spirit with the Higher Mind and with the loving wisdom centered in the Heart Chakra. 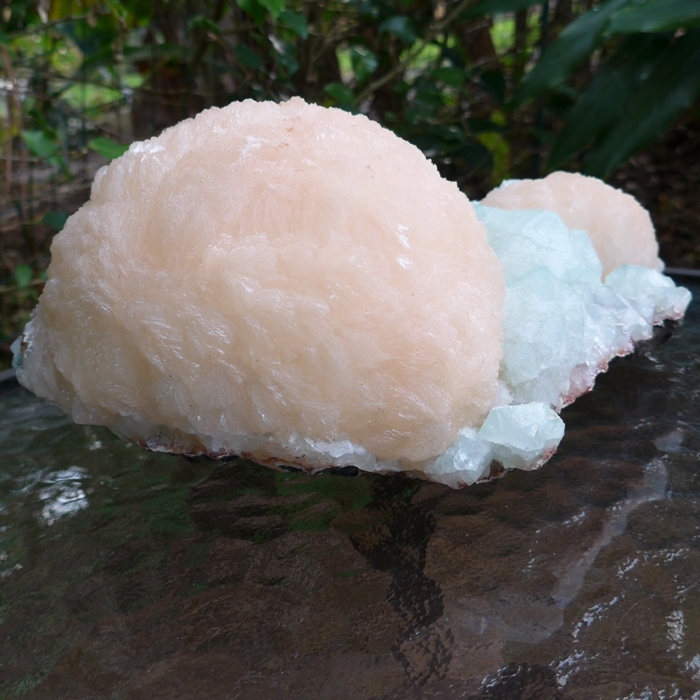 This gorgeous piece is good to use in a treatment room during Reiki or energy healing sessions to help focus, concentrate and direct energy. It would be most efficacious in directing energy through the stone to the crown chakra, the third eye and the heart. Apophyllite is composed of hydrated potassium calcium silicate, and forms tabular crystals of cubic or octahedral structure, occasionally exhibiting the bipyramidal formations. As in this beautiful crystal formation, apophyllite is often found in conjunction with stilbite. The name apophyllite refers to a specific group of phylosilicate minerals, a class of minerals that also includes the micas. 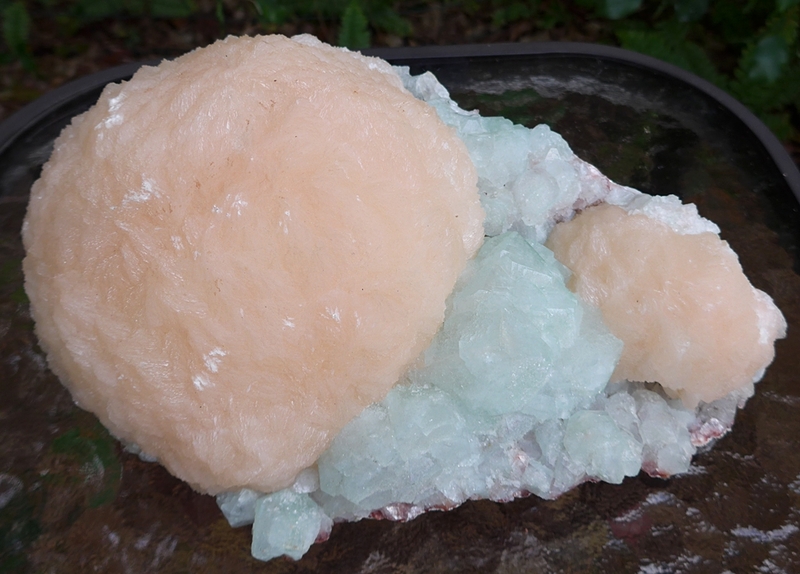 Apophyllite occurs in druzy formations and granular clusters in association with other minerals, such as stilbite, and in natural pyramidal structures. The finest grades of apophyllite, which originate primarily in the area near Pune, India, appear in colors ranging from green to white and clear. Stilbite occurs as pseudo-orthrombic crystals and cruciform pyramidal formations, with a transparent to pearly white translucent luster. Metaphysical rock hounds believe that the energy of stilbite supports contact with the astral realms, and facilitates communication from Higher Worlds, strengthening the bearer's intuitive faculties, imagination, and creativity. Crystal healers have used stilbite to counteract poisons through its ability to remove toxins from the individual's chakra system and energy bodies. Metaphysical rock hounds believe that the energy of stilbite supports contact with the astral realms, and facilitates communication from Higher Worlds, strengthening the bearer's intuitive faculties, imagination, and creativity. Crystal healers have used stilbite to counteract poisons through its ability to remove toxins from the individual's chakra system and energy bodies. In the Western spiritual tradition, the heart chakra is associated with the colors rose and green, and the energy of this large, beautiful rose and green apophyllite and stilbite cluster is most appropriate for meditations and spiritual practices designed to open the heart, strengthen the power of love in one's life, and attract golden opportunities to be of maximum service in the world.